Today Teena and I took the train down to Stratford to see Crazy for You at the Festival Theater. There were a few train delays getting there and we arrived at the theater with just a minute to spare. I'm a little confused by who exactly wrote Crazy for You. It is considered a Gershwin show but didn't go on stage until 1992. George Gershwin died in 1937 and Ira lived a much longer life dieing at the age of 87 in 1983. 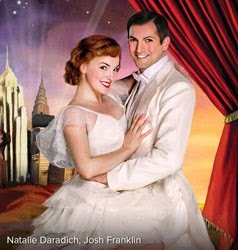 The play is listed as the "New Gershwin Musical", with music and lyrics by George Gershwin and Ira Gershwin, a book done by Ken Ludwig, and co-conceived by Ludwig and Mike Ockrent. I guess where George and Ira do come in is that the play is "suggested" by the 1930 Gershwin hit play, Girl Crazy. Many of the songs, such as I've Got Rhythm, are featured in both. Sometimes I can tire of musicals but this is a very lively, colourful and hilarious production. The songs were great and the cast terrific. I laughed a lot during the play and had a great time. I did find the second act a little long, the show started at two and finished at four forty-five, with a twenty minute intermission. For the most part, I did really enjoy the show and as always, the happy ending that always comes with these type of shows. I give it a 7/10 and feel it is worth the trip to Stratford to see it. I never realized that I've Got Rhythm was from a play. Here is a video of the way I first heard the song when it became a hit back in the 1960s. This is really dated and I enjoyed the shows version much better.